Metabolic acidosis is known to have adverse consequences in patients with chronic kidney disease (CKD) including protein-energy wasting, inflammation, bone disease, and disturbance in endocrine function. Unlike in the management of patients with predialysis CKD, bicarbonate levels were not being routinely monitored in dialysis patients at our center. The KDOQI guidelines recommend serum bicarbonate levels ≥22 mEq/L in patients on dialysis. 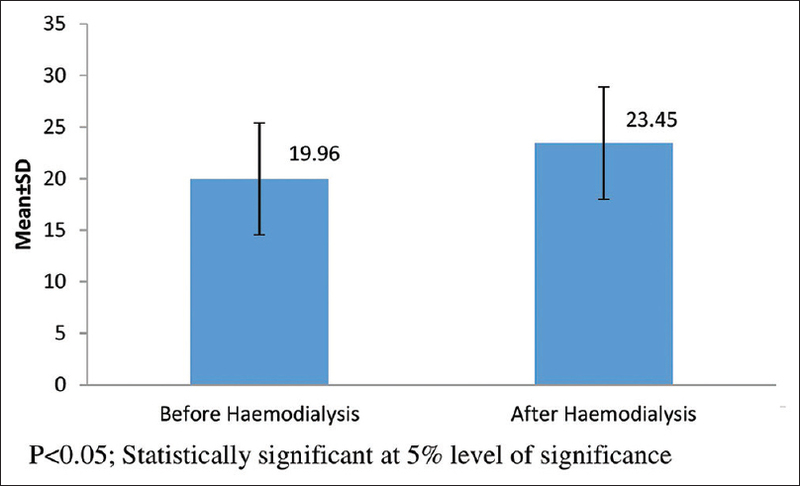 We measured the predialysis serum bicarbonate levels in 100 adult patients on regular hemodialysis (HD) and 41 adult patients on peritoneal dialysis (PD). We also studied the extent of rise in serum bicarbonate levels from predialysis levels after HD in our patients. Predialysis serum bicarbonate level was <22 mEq/L in 73% of patients on HD and 12% of patients on PD. The serum bicarbonate levels remained <22 mEq/L at the end of HD in 41% of patients on HD. Thirty-nine percent of patients were on a HD schedule of thrice a week, and 93% of PD patients performed three PD exchanges a day. The dialysate bicarbonate level was 34 mEq/L. There was a significant increase in serum bicarbonate levels with HD, but the mean postdialysis bicarbonate level was 23.45 mEq/L. A very high proportion of our patients on HD continued to have uncorrected metabolic acidosis, with metabolic acidosis persisting in the immediate postdialysis period in a significant number of patients. 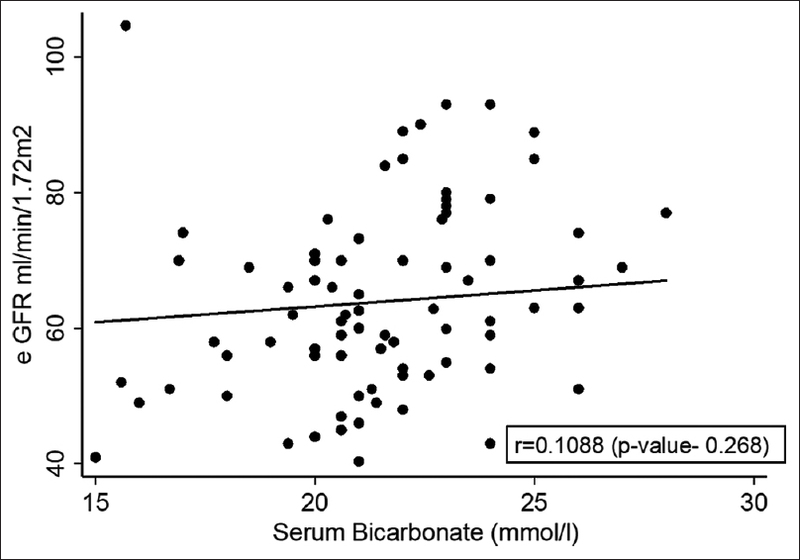 Predialysis serum bicarbonate level needs to be monitored in patients on HD. There is an urgent need to modify HD prescription to ensure better correction of metabolic acidosis in our HD population. Compared to HD, the proportion of patients having persistent metabolic acidosis is significantly lower in PD. Focal segmental glomerulosclerosis (FSGS) is the most common cause of adult-onset nephrotic syndrome, but its pathophysiology is poorly understood. The question as to why only a subset of patients responds to treatment in unanswered. In the past few years, change of podocytic phenotype from stationary type in health to migratory type in disease has been described, of which loss of subpodocytic space is a surrogate marker. 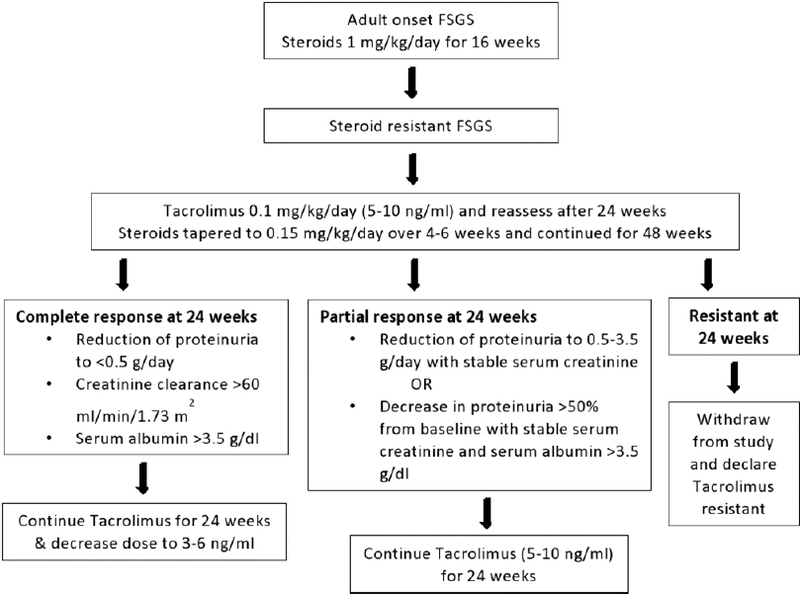 Diagnostic biopsies of adult-onset steroid-resistant calcineurin inhibitor-naïve primary FSGS cases, which were subsequently treated with tacrolimus were included in this retrospective study conducted from 2011 to 2013. The ultrastructure of all cases was studied in detail, especially in context to the presence or absence of subpodocytic space. In the present study, we have compared presence or absence of subpodocytic space in tacrolimus-responsive versus tacrolimus-resistant cases to identify potential electron microscopic features predictive of response to treatment, of which loss of subpodocytic space indicating migratory phenotype is the most important and consistent feature. The present series included 7 tacrolimus responsive cases (includes two cases with partial response) and seven tacrolimus-resistant cases. The tacrolimus-resistant patients were of older age, had a longer duration of illness, and a lower eGFR as compared to tacrolimus responsive cases. The subpodocytic space was preserved in patients on tacrolimus with complete remission and lost in patients with partial response and tacrolimus-resistant cases. Xanthogranulomatous pyelonephritis (XGP) is an uncommon and distinct type of chronic infective pyelonephritis causing destruction of the kidney, severely affecting the renal function. The perinephric adipose tissue and peritoneum is not uncommonly involved. The study was undertaken to decipher the clinicopathologic spectrum of XGP. Forty cases of XGP were diagnosed on histopathology over a period of 13 years (2005–2017). Relevant clinical details and radiological findings were recorded from the case files. Out of a total of 40 cases, 26 were female and 14 were male with a mean age of 39.5 ± 13.6 years. Flank pain was the most common presenting symptom. All the patients had unilateral disease and underwent nephrectomy for a nonfunctional kidney. 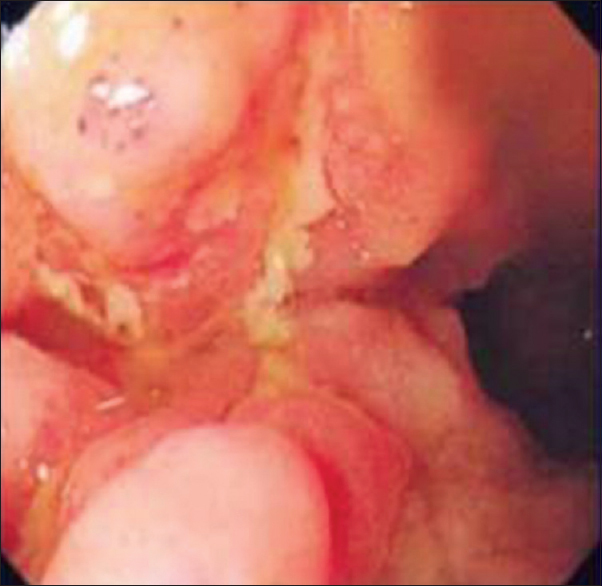 Gross examination showed enlarged kidney with replacement of cortico-medullary tissue by yellow nodular areas of fatty tissue and dilatation of the pelvicalyceal system. 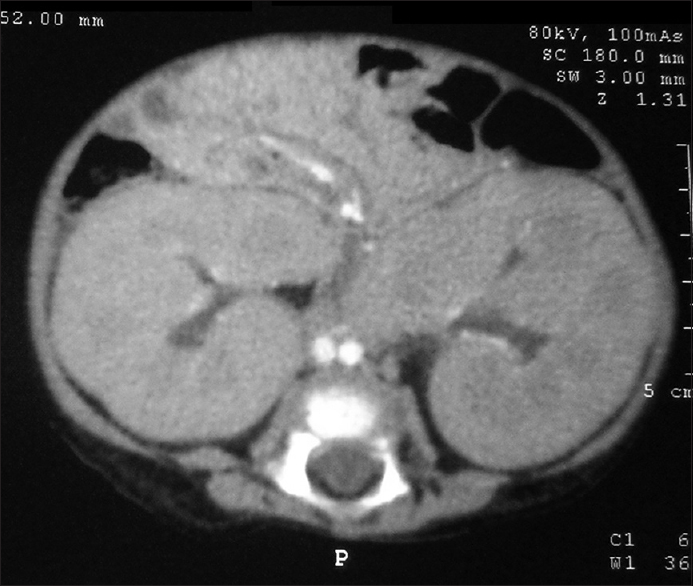 Thirty-six (90%) cases had nephrolithiasis. 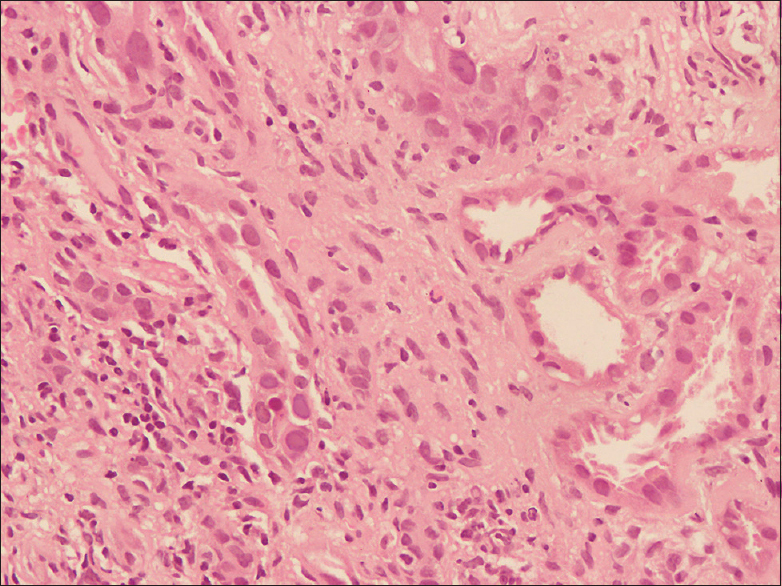 Histologically, the characteristic feature was the existence of lipid-laden foamy macrophages. Renal parenchymal involvement was diffuse in majority (31, 77.5%). Two (5.0%) of the patients had coexisting carcinoma in the same kidney. 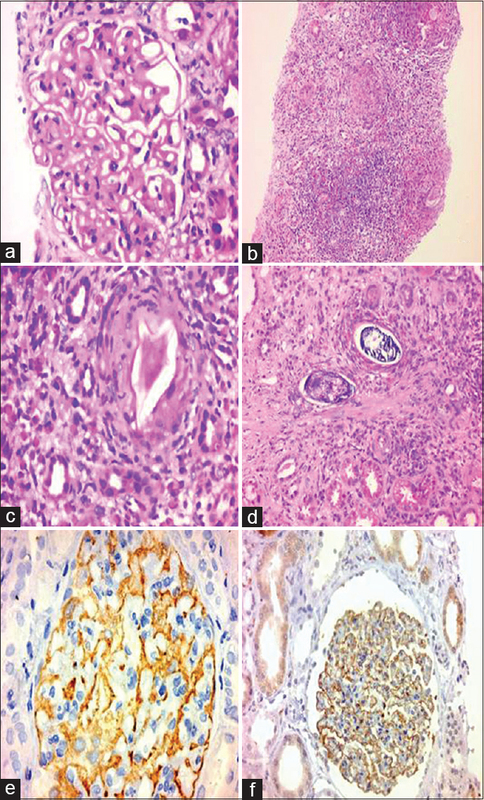 Histopathologic examination gives the definitive diagnosis of XGP which relies on the characteristic morphology. Surgical intervention in the form of nephrectomy is the treatment of choice and offers good treatment outcomes. Metabolic acidosis is a prevalent yet overlooked entity among renal transplant recipients (RTRs) and incurs adverse effects on graft function. 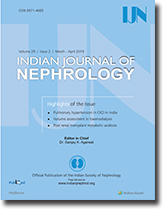 Although graft dysfunction and calcineurin inhibitor usage have been linked with renal tubular acidosis (RTA), there is no Indian data on prevalence or risk factors of post-transplant acidosis. A cross-sectional study was conducted on 106 adult RTRs, with a transplant duration of >6 months and an estimated glomerular filtration rate (GFR) >40 ml/min/1.73 m2. Acidosis was diagnosed on basis of plasma bicarbonate and arterial pH. Serum and urine electrolytes with anion gap were determined to diagnose and type RTA. Acidosis was diagnosed in 44 of 106 patients (41.5%) with 23 (52.27%) having severe acidosis. Type I RTA was the most common subtype (52.5%) followed by type IV (30.9%) and type II RTA (7.5%). 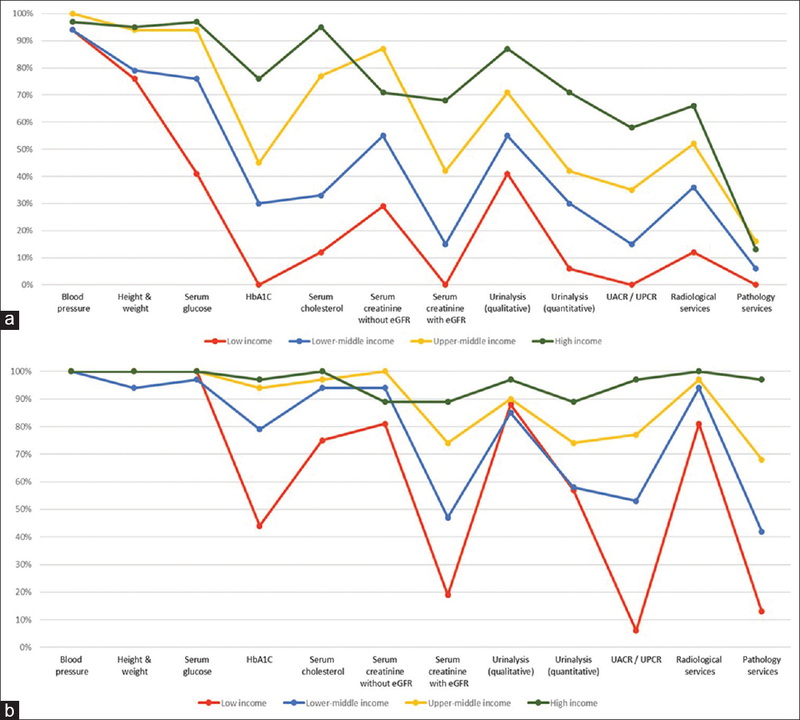 The correlation between estimated glomerular filtration rate and acidosis was minimally linear (r = 0.1088), with multivariate analysis revealing previous acute rejection episodes, current serum tacrolimus levels, cotrimoxazole usage and intake of animal proteins to be independent risk factors. The serum albumin levels were low in the acidosis group and showed linear correlation with bicarbonate levels (r = 0.298). There is a high prevalence of metabolic acidosis in RTRs with type I RTA being most common subtype. Screening of RTRs on a regular basis is a feasible approach for early diagnosis and intervention. However, prospective studies are needed to demonstrate the effect of acidosis on graft survival and benefit of bicarbonate therapy in RTRs. C1q nephropathy is a rare glomerular disease defined by the presence of characteristic mesangial dominant or codominant C1q deposition on immunofluorescence microscopy. Neurofibromatosis type 1 (NF-1) is an autosomal dominant syndrome caused by a mutation of a gene located on chromosomal segment 17q11.2. Nephrotic syndrome has rarely been reported in patients of NF-1, and the relation of NF-1 with nephrotic syndrome is unclear. 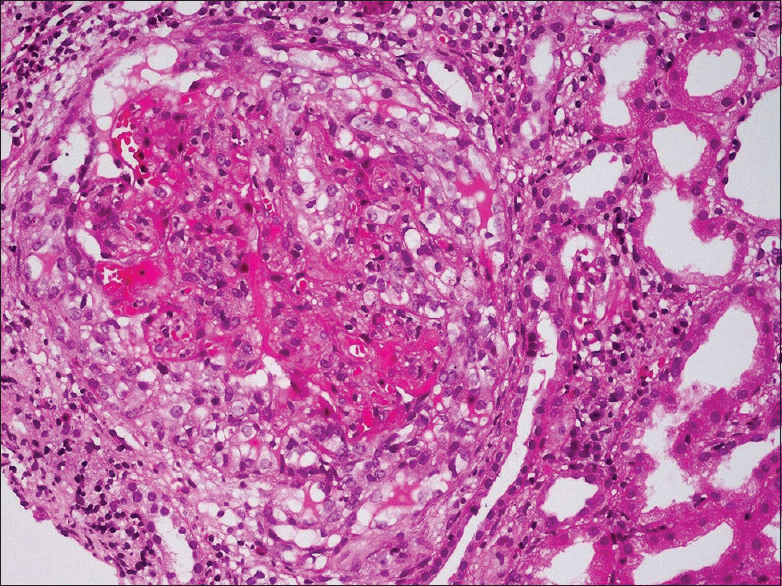 Here, we present a rare case of C1q nephropathy in a patient of NF-1. 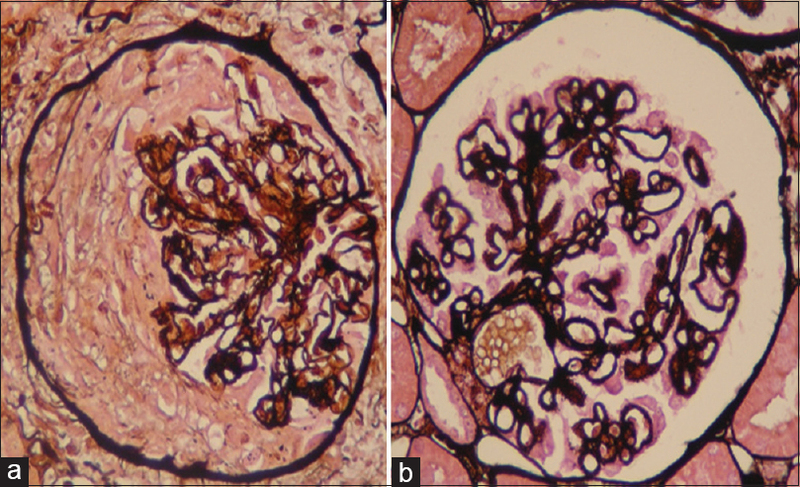 The association of bilharziasis with membranous nephropathy (MN) has long been debated. The relatively recent use of antibodies against the M-type phospholipase A2 receptor (PLA2R) has been proposed as a valuable tool to discriminate the idiopathic from secondary MNs. Anti-PLA2R antibodies are found in sera from about 70% of iMN patients, in contrast to patients with secondary MN, in whom serum anti-PLA2R antibodies could not be detected. In the current case report, we detected anti-PLA2R antibodies both in serum and renal biopsy from a patient with MN associated with Schistosoma mansoni. This finding confirms the idiopathic nature of the MN and excludes schistosomiasis as the triggering agent of MN. 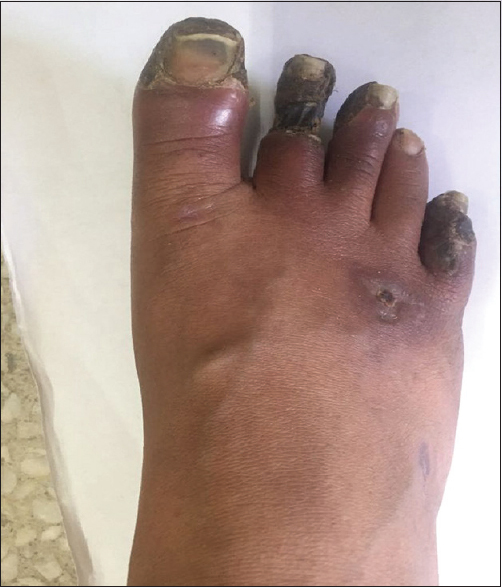 After treating bilharziasis, Ponticelli regimen was initiated without a significant improvement.